G2 Esports made it to the finals of the 2018 EU LCS Spring Split playoffs only to fall at the final hurdle in a 0-3 loss to Fnatic. Last weekend, G2 started their road to reclaim the title and looked strong in their first two matches, but will it be enough? Though G2 made it to the finals of the Spring Split, they still had problems that prevented them from winning and repeating as champs yet again. Their late-game weakness, inability to play around Baron correctly, and lack of strength in the bot lane held them back from lifting the trophy. In order to win the Summer Split they would have to fix these issues, and we got a first glimpse of whether they did so this past weekend. To be fair, it’s tough to tell if G2 actually fixed their problems due to the current meta. The meta right now is all about quick games that end before teams reach the late game, and bot lanes have a decreased impact because non-traditional champions are being played in that lane. G2 were a fantastic early game team last split and they showed that again last week in their first game against Team ROCCAT. G2 started off the game with an advantage after taking an early kill. They snowballed that advantage to finish the game in under 24 minutes. They moved around the map well to take down turrets quickly and build up a massive gold advantage. On top of reaffirming their early game power, the bot lane played well. 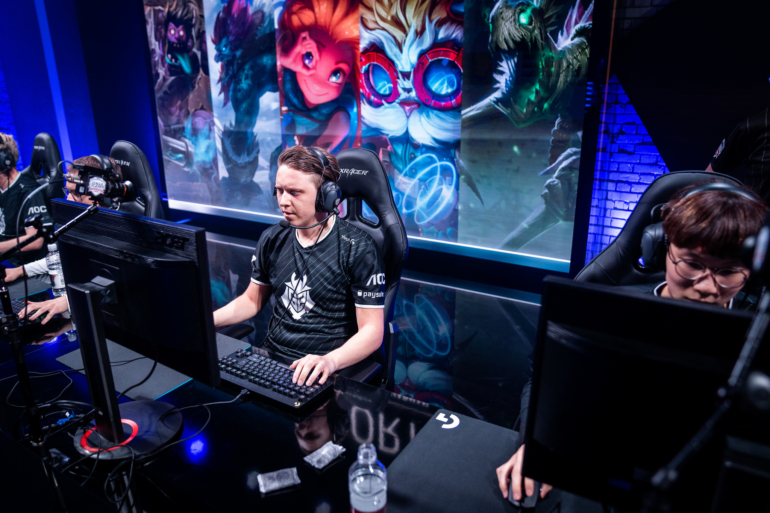 Petter “Hjärnan” Freyschuss showed his adaptability by playing Heimerdinger in both of G2’s games. He played the champ well and helped facilitate G2’s early advantage by taking down turrets. Last split Hjärnan was less than stellar in his play and this new meta may suit him well as he gets to play non-traditional bot lane champions. It’s hard to tell with only two games under his belt this split, but the signs are positive for Hjärnan. Luka “PerkZ” Perković wasn’t a weakness for G2 last split—instead he was their most important player. He showed that he still can be considered as such in G2’s game against Splyce. The team tried out a gold funnelling strategy with PerkZ playing Kai’Sa. This strat revolves around giving farm and resources to the Kai’Sa at the expense of others.PerkZ took all the resources given to him, mainly from Marcin “Jankos” Jankowski, and turned that into a carry performance, which almost resulted in a penta kill for the mid laner. Though the team did not play a resoundingly dominant early game, they did not have to with this style of composition. Instead, they controlled the game and took off once PerkZ hit his power spike. G2 looked very dominant in their first two games but it was against opponents with a combined record of 1-3. Not only that, but the meta favors G2’s existing strength. For as long as this meta exists, G2 will be at the top of the league—but the real test will come when this meta goes away and G2 is forced to either play to their bot lane or play for the late game. Then we will see if the squad has been able to fix their Spring Split issues, or whether they will suffer the same fate two splits in a row.